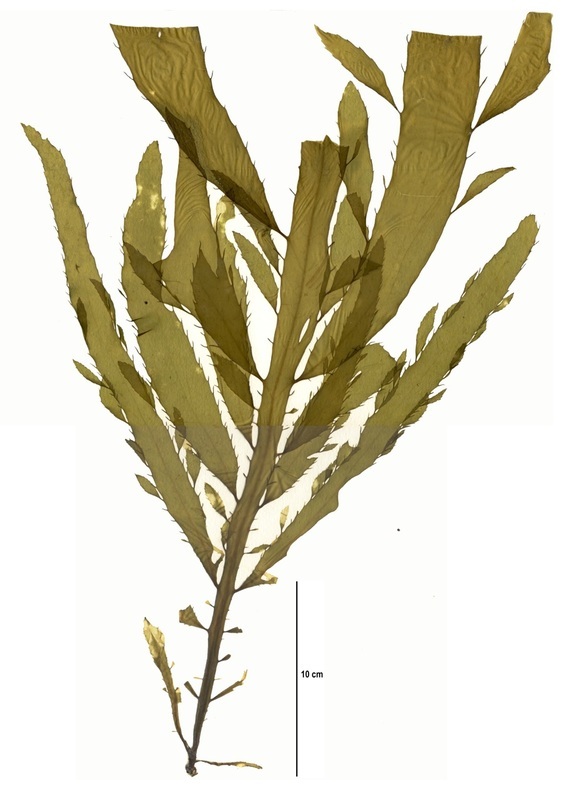 Specimen collection numbers PTM 446 (left), PTM 448 (middle), and SCL 15309 (right, in three parts) in the UBC Herbarium Algae Database. Search the collection number in the database for more information on these specimens, or search the species for further occurrences. Images courtesy of Sandra Lindstrom. 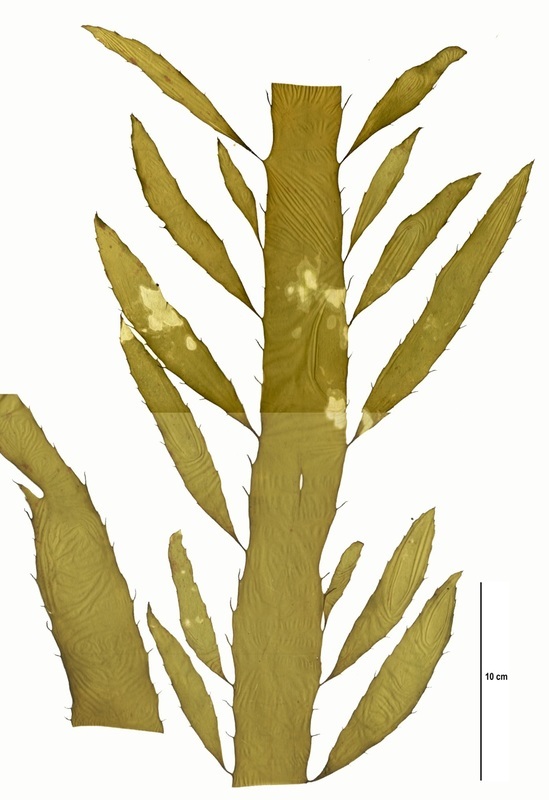 The thallus of this brown seaweed is flat, with a strap-like (ligulate) main axis bearing a midrib. This main axis branches profusely, with one or two orders of branching and branches (also ligulate) measuring more than 1 cm wide. * Note: there is uncertainty regarding the distinctions between some Desmarestia species, including D. latissima, D. ligulata, and D. munda. Currently all three are accepted species, however more work needs to be done to determine if any of these species, or others in the genus, are morphological variations of the same species. Gabrielson et al. describe D. ligulata as having more than two orders of branching and branches measuring less than 1 cm wide, whereas D. latissima has one or two orders of branching and branches measuring more than 1 cm wide. Other sources distinguish D. ligulata and D. munda on similar grounds, with the latter having wider branches than the former, and branches at least as wide as the main axis. None of these sources describe all three species. 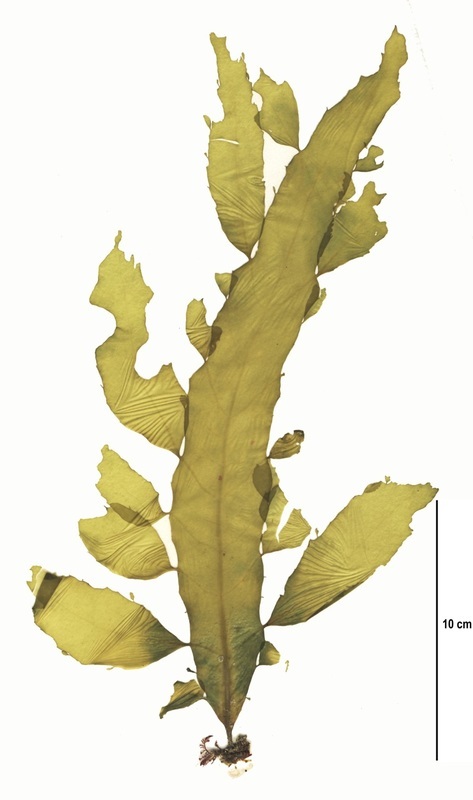 Two of the specimens shown here were found growing on subtidal boulders, while the other was loose and drifting. All were found on moderately exposed shorelines on Calvert Island (Fifth Beach and North Beach). This species has been reported in Alaska, British Columbia, and Washington State. O'Clair, R. and Lindstrom, S. Desmarestia munda Setchell et Gardner 1924a. In Klinkenberg, Brian. (Ed.). E-Flora BC: Electronic Atlas of the Plants of British Columbia. Lab for Advanced Spatial Analysis, Department of Geography, University of British Columbia, Vancouver. Accessed 13/04/2016.